Bamboo provides a range of options that allow you to control your release naming scheme. 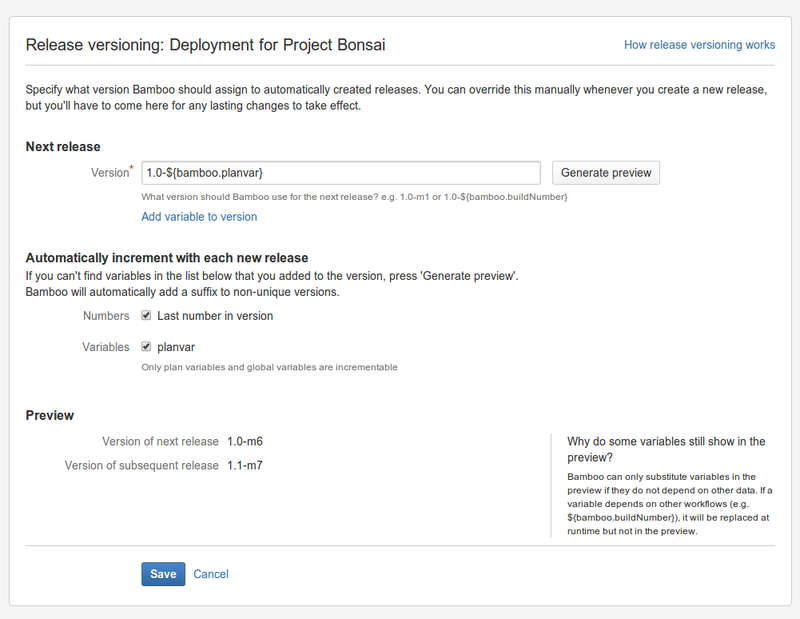 You can specify how Bamboo handles release versioning, and control automatic incrementing between releases. Bamboo also allows you to manually override automatic release settings when you create a new release. Next release The identification for the next release name that Bamboo will create. In simple release naming, you should use something straightforward like 1.0. If you want the naming scheme for the release to be applied to branches, select 'Apply the same naming scheme to versions create from branches'. Automatically increment with each new release Check the 'Numbers' checkbox to automatically increment the release number according to the 'Next release' field, as defined above. If you leave this box unchecked, no release number incrementing will occur. This field allows you to preview what the next release name will look like. To view the preview, click on the Generate preview button next to the 'Create release name' field. Note: In some cases, a preview may not be available. 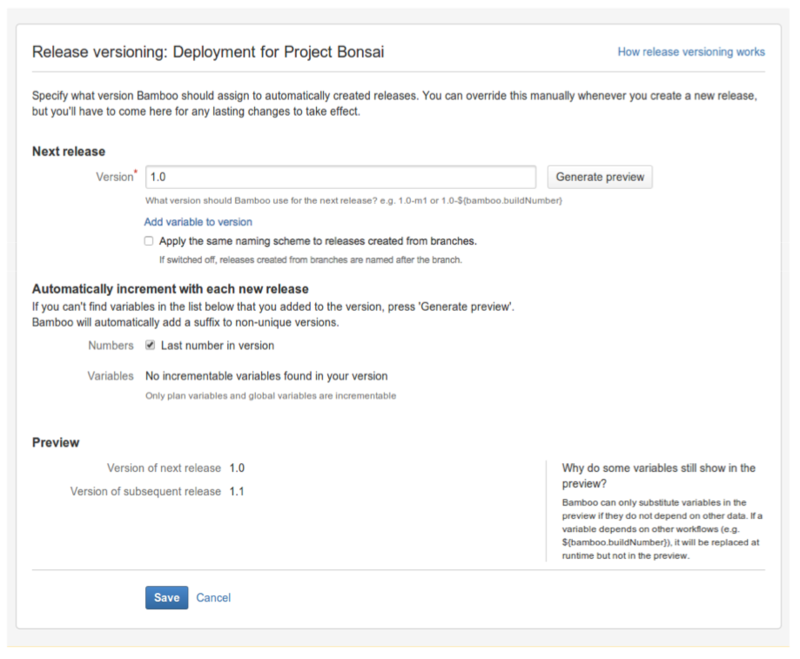 Release versioning using variables allows you to develop more complex naming schemes, based upon variables set up within Bamboo. 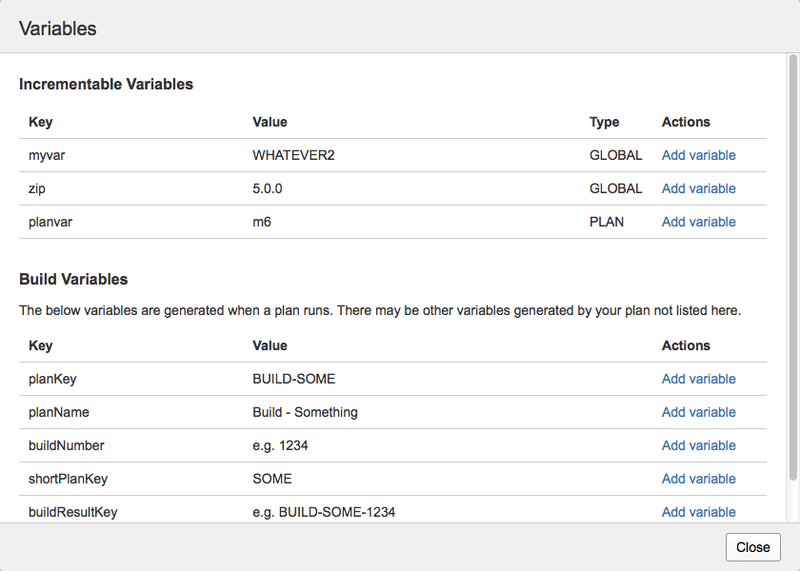 You can use global, plan and build variables in your releasing scheme. For security reasons, you can't use password variables in version names. VERSION (バージョン) The identification for the next release name that Bamboo will create. In simple release versioning, you should use something straightforward like 1.0. Automatically increment with each new release 1.Check the 'Numbers' checkbox to automatically increment the release number according to the 'Next release' field, as defined above. If you leave this box unchecked, then no release number incrementing will occur. Bamboo also allows you to use combinations of simple and variable release naming. The following table provides examples of combined naming schemes and demonstrates how careful control of the Numbers and Variables checkboxes can be used to customize your scheme.